Imagine spending your life knowing nothing but the inside of a small, metal crate. Your sole purpose in life is to give birth over and over again yet you receive barely any human interaction, let alone love. That is the life of a puppy mill dog. That was the life of Schnitzel the English bulldog. Schnitzel came from an Iowa puppy mill living in nothing more than a small cage in horrendous conditions producing litter after litter of puppies. But just when all hope was lost, Schnitzel was rescued. When volunteers from Texas-based DFW Pug Rescue found her at the puppy mill, they were actually there to rescue 37 pugs. They noticed that in addition the pugs, the owner also had a group of English bulldogs. 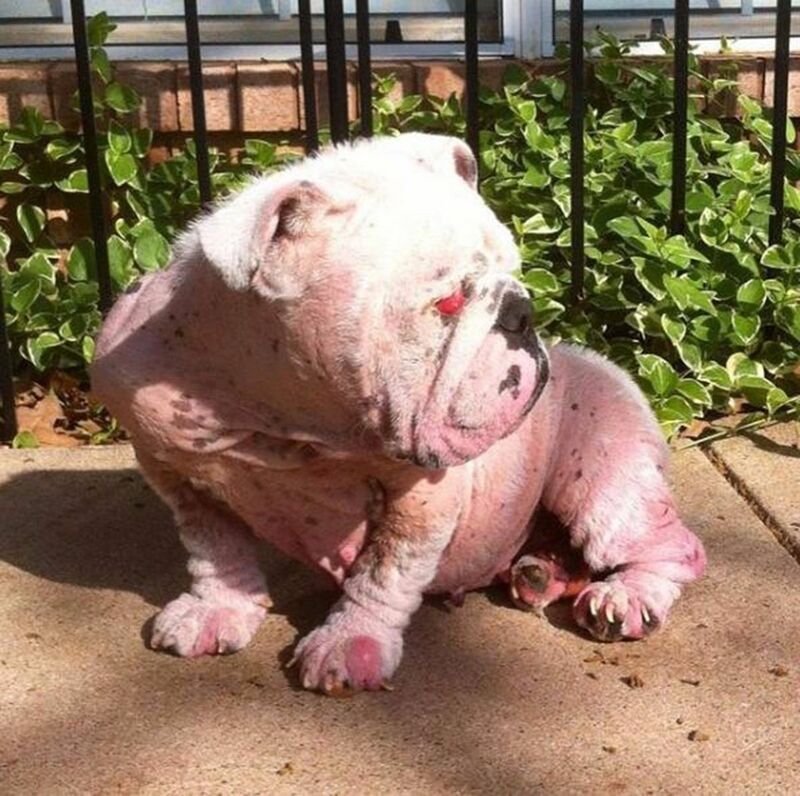 The bulldogs, along with the pugs, were rescued. Three of the rescued bulldogs were transferred to Lone Star Bulldog Club Rescue, including Schnitzel (formerly known as Angelina Jolie). When she arrived at the rescue, Schnitzel had numerous medical issues. She suffered from severe cherry eye in both of her eyes to the point where she could hardly see at all. She also suffered from a sensitive stomach, demodectic mange, infected ears, kennel cough, a tail so infected it had to be amputated, and pneumonia. (The Dodo). Thankfully, Schnitzel was put in foster care where she could begin her road to recovery. It was unclear whether Schnitzel would ever be adopted due to her many issues. Ashley and Hans Helkenn already had a bulldog, Hummer, and wanted to get him a friend to play with. Almost by fate, they were matched with Schnitzel. Hans was a bit skeptical at first but Ashley knew Schnitzel was meant to be theirs. Helkenn didn’t care that Schnitzel had so many issues, there was something about her that Helkenn connected with. Schnitzel had a difficult time adjusting to her new life. She didn’t know how to handle human interaction well and had trouble with house-training. She also had to follow a strict diet due to her sensitive stomach. The Helkenn’s never gave up, though, and Schnitzel slowly starting adapting to her new life. 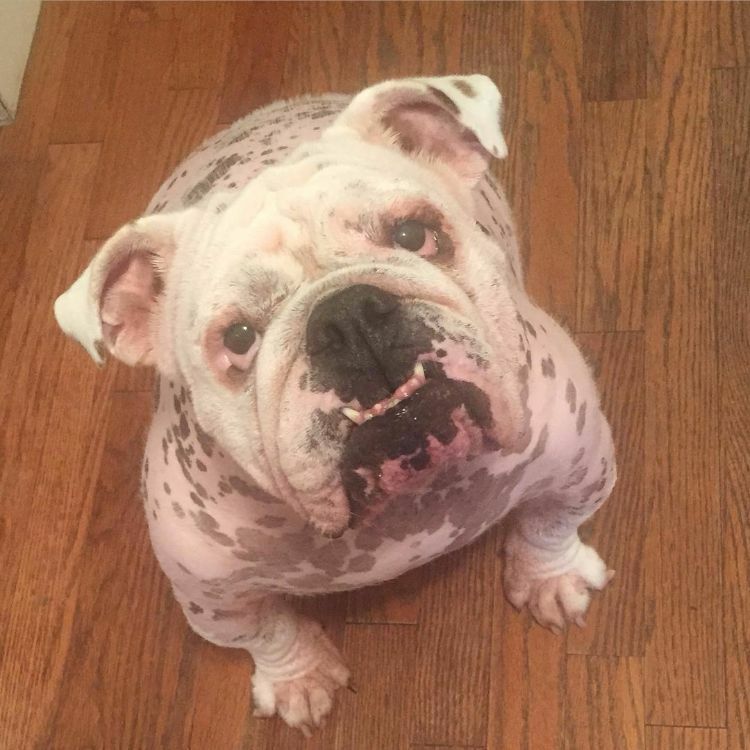 When the Helkenn’s other bulldog, Hummer, was diagnosed with dementia, it caused some issues with Schnitzel. Hummer would start to act aggressive towards her and act like he had no idea who she was. They eventually got a routine down with few issues but their saving grace came in the form of another rescue bulldog: Bratwurst. Bratwurst (formerly known as Brad Pitt) was rescued from the same puppy mill as Schnitzel and was initially fostered with her as well. Bratwurst was adopted but later returned. His adopters contacted Helkann to see if she would take him and she said yes – only if Schnitzel and Hummer agreed. Bratwursts calm, laid-back personality is exactly what Hummer and Schnitzel needed. Bratwurst keeps an eye on Hummers mood and helps Schnitzel calm her anxiety and gain confidence. What Helkenn loves most about Schnitzel is her attitude. Though she is skittish sometimes, she always gives humans the benefit of the doubt. Despite her past, Schnitzel was never filled with hate or mistrust. She has a bravery that Helkenn admires. Although Schnitzel spent the first part of her life with no love and no hope, she will live the rest of her in a home filled with all the love and support she deserves. Make sure to follow the life of Schnitzel, along with Hummer and Bratwurst, on her Instagram page.